What is ECDIS or Electronic Chart Display Information System and its advantages? ECDIS is thus more than an “electronic nautical chart”. Nautical charts are in fact presented electronically, but in principle all kinds of chart – aviation charts, street maps, railway maps, etc. – could be presented on a computer display using the same methodology. However, we shall restrict ourselves to comments on the electronic nautical charts. ECDIS was initially developed for shipping, and thus the use of both terms as synonyms is entirely justified. 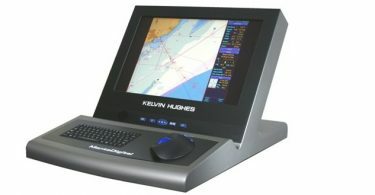 The International Hydrographic Organisation (IHO) in the 80s identified that emerging computer technology and position fixing systems could provide a digital representation of the paper chart on a computer screen, along with real-time positioning and interfaces to radar and other navigation sensors. The IHO formed working groups to define the standards for data encoding and digital chart presentation. The first standard, S-57, describes the data model, object and attribute definitions for charted objects, encoding guidelines, product specifications and data structure of the Electronic Navigation Chart (ENC). The second standard, S-52, describes the presentation of the colours as well as chart and navigation symbols for ECDIS. The new amendments to SOLAS Chapter V (Safety of Navigation) Regulation 19 ‘Carriage Requirements for Shipborne Navigational Systems and Equipment’ require mandatory carriage of ECDIS for certain new ships built on or after 1 July 2012 and a subsequent timeline plan for retrofitting ECDIS to existing applicable ships. The Manila amendments to the STCW code have also been updated to complement the new ECDIS carriage requirements and include mandatory training for ships operating with ECDIS. The Manila amendments entered into force on 1 January 2012. WHAT ARE THE COMPONENTS OF ECDIS? Is generally a computer with graphics capability, a high performance PC or a graphics workstation installed in a console linked with other items of ship’s equipment. Thus, ECDIS obtains the course from the gyro compass, the rate of turn from the turn indicator, and the ship’s speed through water from the log (the ship’s “speedometer”). Key features are the links with the position sensors of the ship (transit satellite navigation system) and in particular with the GPS (global positioning system, a satellite based positioning system), supplying via the NMEA interface a constant stream of highly precise position data (NMEA National Marine Electronics Association; NMEA0183 Standard for Interfacing Marine Electronic Devices, data record). Even radar pictures can be superimposed, either as raw data from a rasterscan radar, or as synthetic ARPA (automatic radar plotting aid) radar information. The hardware should be type-approved and comply with the guidelines of International Electro-technical Commission. 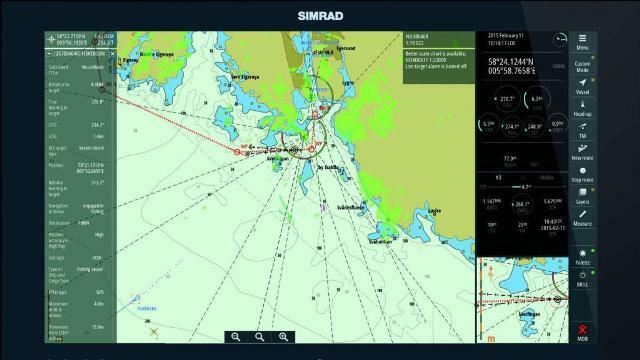 Should be as the IMO Performance Stanadards [Resolution A817(19)] It consists of the user interface (UI) and the so-called ECDIS kernel, the software that makes it possible to read the data and display a chart. This software is also called ‘function library’. In addition to the chart picture, the user interface shows buttons and keys for operating the nautical chart. Electronic navigational Chart (ENC) –There are two different types of electronic charts in use with ECDIS and all navigation officers and marine managers should be aware of their differences and limitations. ENC’s enable the ECDIS to set different types of navigational alarms to act as a warning to the mariner. These warnings are usually visual as well as audible to give a clear indication of any dangers that lay ahead. The navigational alarms can include such hazards as shallow depths, shoals and isolated dangers as well as minimum under-keel clearance (for example, anti-grounding alarm) provided the ships echo sounder has been integrated with the ECDIS, draught details and alarm parameters specified. Early warning alarms of approaching waypoints and alteration of course points, position fixing reminders and changing electronic chart alarms can also be specified within the alarm parameters. ENCs provide the mariner with a clear display of the navigational situation without distorting the chart display when reducing the chart scale.ENC must conform to IHO (International Hydrographic Office) S-57 standards. when operating in ‘base’ or ‘standard display’ mode. As a result, route planning and monitoring alarms may not always be activated when approaching such dangers and may result in groundings. Mariners must ensure their ECDIS display has been set-up properly to the circumstances and conditions so that it includes all information necessary for safe navigation. ECDIS display modes that are set-up in ‘base’ display mode may remove vital information. WHAT ARE ADVANTAGES OF ECDIS? Weather and forecast data can be superimposed. What is the difference between Raster & Vector Electronic Charts? Is basically just a visual scan of a paper chart. It is a computer based system which uses charts issued by, or under the authority of, a national hydrographic office, together with automatic continuous electronic positioning, to provide an integrated navigational tool. RASTER CHARTS are digitized by “scanning” the paper chart (using technology common in desktop publishing). Each tiny segment of each line on a chart is converted to a “raster” picture element or “pixel”. These pixels are similar to a television picture or magnified newsprint in that they appear as “dots” on a grid. That is where the raster chart stops: the pixels form images on a computer screen, but the computer is “dumb” about what the images mean. Is more complex. Each point on the chart is digitally mapped, allowing the information to be used in a more sophisticated way, such as clicking on a feature (for example, a lighthouse) to get all the details of that feature displayed. Symbols and colour vary with manufacturer. Symbols and colour are the same as the paper chart equivalent. The IHO publication S-52 defines new colours and symbols for ENCs. What are errors of ECDIS? What are Limitations of ECDIS? What are ECDIS Back-Up Requirements? Difference between RCDS AND ECDIS? CURRENT IHO ECDIS and ENC STANDARDS? What to do in areas without official ENC coverage? What is ECS ( ELECTRONIC CHART SYSTEM)? What are the disadvantages of RASTER charts? What are the advantages of raster charts? What are the disadvantages of Vector charts? What are the advantages of VECTOR charts?